Saree are eternally favorite for all women. Its an ideal attire which can suit for any occasion. Styling saree to your work place is different. Sarees are no longer reserved for home or parties have entered board rooms, meetings reaching new dimension as the new formal wear. To look professional avoid colurs that are too loud to wear. Bold colours create distraction in the work place. It will be apt if you choose shades like white, black, blue, green, beige, light yellow, light pink and other pastel shades or earthy tones to instigate the finesse in your sarees. Avoid zari work, sequin work, shimmery georgettes, net sarees and neon colors and bright red and oranges as they are more suited for festive occasions. The Bengal taants, light cotton sarees, Handloom sarees, cotton kalamkari sarees, white or ivory shaded Kerela cottons, khadi sarees, muted handloom sarees, Jute silk and light crepe sarees should be there in every working woman’s wardrobe. Blouse have a good influence in changing the overall appearance. Boat necks, collar necks, simple U Neck, long sleeves are some fine ways to make your blouse stand out yet not overloading your saree look. Do try them to infuse professionalism in your outfit. You can try these blouse designs for office wear sarees and make a new fashion statement in your office. Office is not a place to be an attention seeker so avoid bright lipsticks and Shimmery highlighter. Always opt for Neutral makeup's. One thing that can seamlessly inject professionalism to a saree, then it’s a watch. A watch does more than just telling time. Pair your sarees with an edgy watch and see the magic unfolds enhancing the chicness of your overall look. Watch have that inbuilt trait to make you look downright formal and elegant. 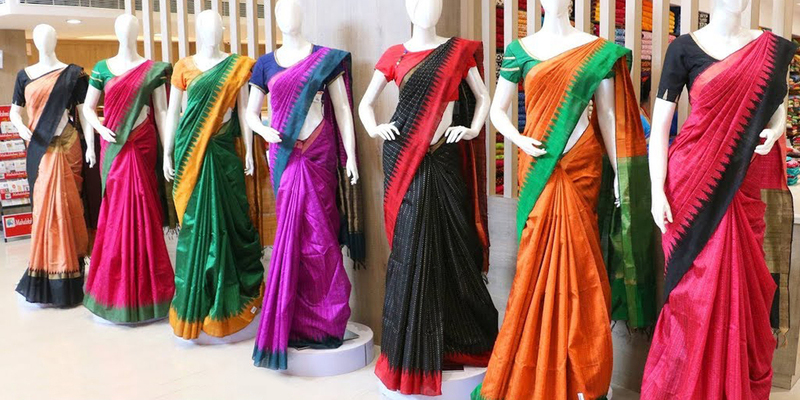 with Sarees in Trivandrum (Home), Silk Sarees online, Banaras Saree, Kanchipuram Silk sarees, Kalamkari sarees online, Handloom sarees online.